You may remember the recent video that surfaced of a major health system CEO talking about prioritizing patients with private insurance. If not, let me share this has been a hot topic recently that has pushed payor mix, and ways hospitals may attempt to influence their particular payor mix, to the forefront. One item that was not made clear in the recent release was how the Mayo clinic CEO suggested influencing payor mix. The comments made clear any patients seeking emergency care would receive what they need, but, for elective patients, would Mayo attempt to open clinics / other entities in areas populated by patients with better payors? That's one clear way to influence payor mix overall. Or did it mean to prioritize on an individual basis? No matter the specifics of the comments (which may make all the difference) the mention of prioritizing patients touched off rapid and significant discussion. 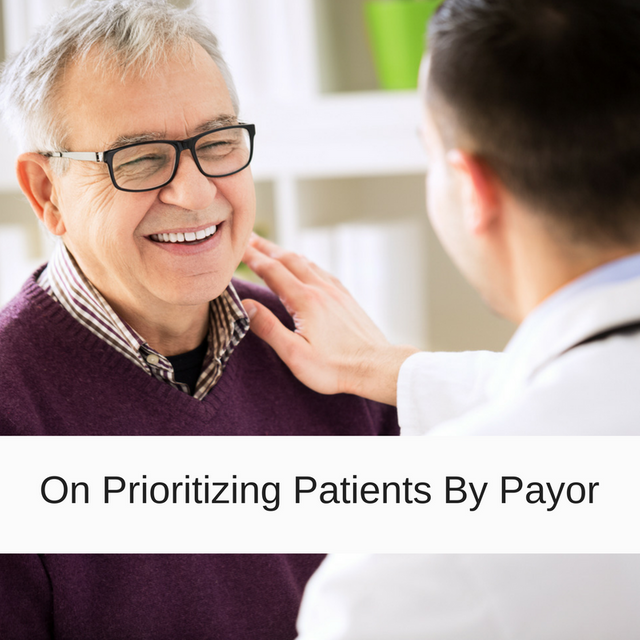 Click the link below for some recent comments in Becker's about this important topic of prioritizing patients by payor. I urge hospital administers to take the opportunity to improve quality and decrease waste by focusing on value instead of patient volume. Once a hospital has a quality system in place, the payer source becomes less important, which means no one has to be 'prioritized.' While the future of healthcare is unknown pending the House vote on Thursday, many Americans are worried that they could lose their care. Knowing they could be deprioritized over others (even if they keep their insurance) doesn't provide hope for when they need medical attention in the future. Prioritizing is not the right solution.